The silver arrows seem able to keep their opposition at arms length with predictable ease. However, the development race of F1 means that you can't rest on your laurels and even the smallest of changes are considered in the pursuit of performance. The team arrived in Austria with a couple of small iterational changes. 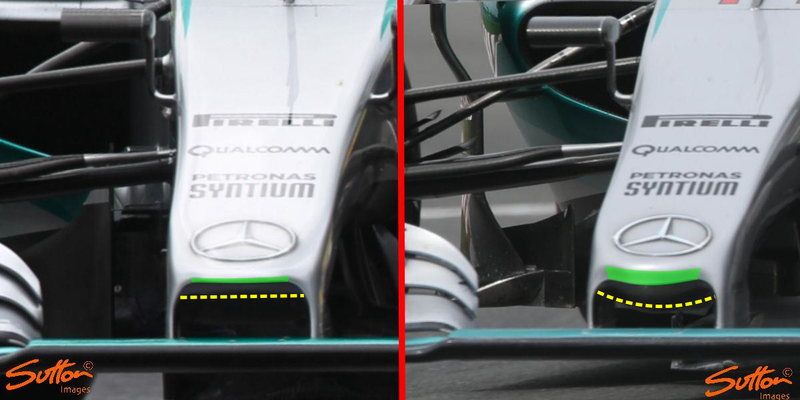 The nose tip has been reshaped, with the tip (green) and under chin (dotted yellow line) flattened out, allowing a little more flow under the nose and marginally changing its impact on the front wing neutral section below. 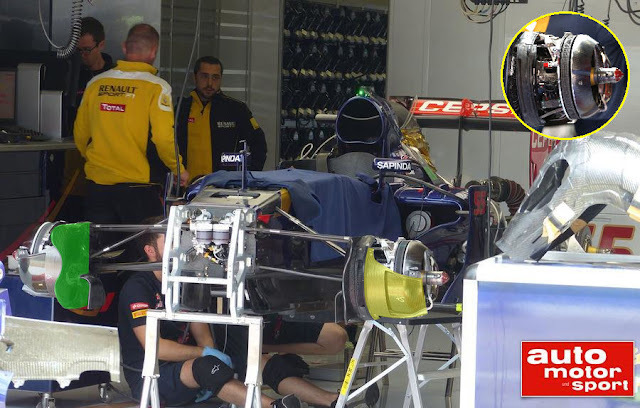 Meanwhile, at the rear of the car the detached bodywork (highlighted in green) which sprouts from the cooling outlets (highlighted in yellow) have also been altered. Their position is based on how the airflow moves around the coke bottle region and over the diffuser, adopting a different position will change these flow structures, with one pulling on the other, just like an aspirator. The wider positioning in Austria is indicative of a higher downforce circuit and the need to expel the hot air from the cooling outlets expeditiously, whilst improving flow over the sidepods surface. The Scuderia have once again made changes in the rear tyre deck region, albeit this time in a redesign of the vertical floor strake, having previously utilised a singular element the team adopted a twin strake configuration (marked in yellow) for the Austrian GP. This area is quite sensitive and so changes in the region are usually a compound effect, where one change usually leads to another a few races later. Ferrari last made a change in Barcelona, with the addition of two additional floor slots, ahead of the main dog led slot which has adorned the floor for some time, all of which look to manage the effects of tyre squirt. Tyre squirt is the injection of flow laterally into the diffusers path as the tyre deforms. This can be detrimental to performance especially at the critical cornering phase when downforce is required the most. The change to a twin strake is to improve the performance of the airflow over the diffuser, whilst assisting how the airflow is managed by the tyre squirt slots. Meanwhile, a relatively small change at the front of the SF15-T sees two small winglets added to the upper leading edge of the splitter. These winglets have found their way onto the McLaren, Toro Rosso and Lotus already season as all the teams look to improve flow in the region. The wake generated by the front tyres can have an impact on the flow quality provided by the splitter, especially in transient conditions, as the tyre deforms. These, albeit small winglets help to condition some of this errant flow, re-energizing the flow by virtue of the vortex they'll shed. 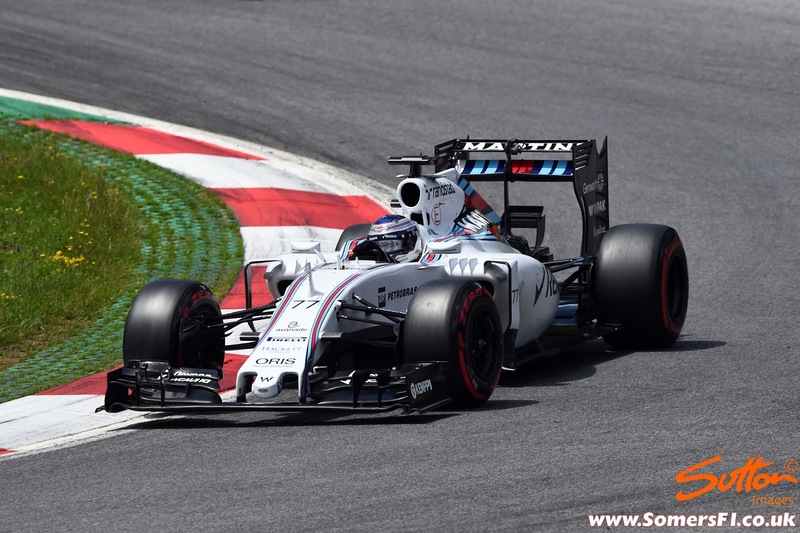 Williams had a number of updates available to them for the Austrian GP which I covered here for Planet F1. During the first day of the post race in-season test the team sparked controversy when the used a winglet and side skirt that would be illegal in race conditions. I explained why they were doing this for Planet F1. On the second day Bottas took over from Susie Wolff to conduct further tests and it seems the Finn rather than having downforce bolted onto the FW37 was happy to test with a lower downforce setting, running with DRS activated in areas it's normally forbidden. Peter Prodromou's departure for McLaren during 2014 has clearly had an impact on the Milton Keynes based squad, with Dan Fallows now in charge of the aero department. Different designers follow different philosophies and so even with the omnipresent figure of Adrian Newey looking over his shoulder he's undoubtedly doing things his way. That transitional phase takes time, something you can ill afford in the F1 environment. Red Bull arrived at their home grand prix under no illusions, they have almost insurmountable task in terms of mounting a challenge at the front of the grid. Undettered as any F1 team worth their salt is, the team had a few new parts at their disposal. 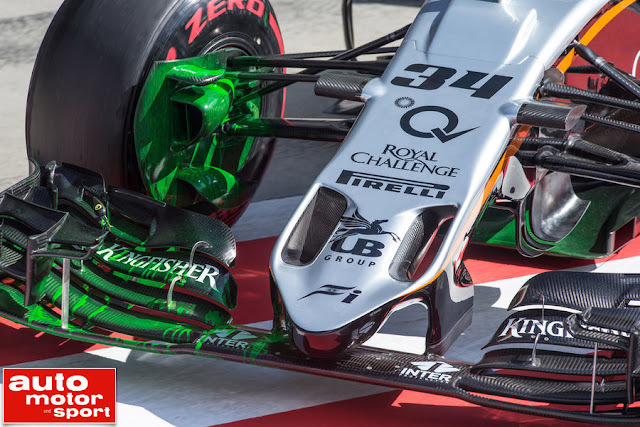 The team had a revised front wing to assess in Austria (left, captured by Albert Fabrega) and although it wasn't raced it does show the team are looking at alternative solutions. The main cascade was enlarged, whilst the usual twin horizontal winglets that mount to its endplate were replaced by an 'r' cascade. The 'r' cascade had a bridge fixture from it to the main cascade which supports the whole structure. These changes reshape the airflow received by the front tyre, changing the wake profile, which can have an impact of flow structures downstream, reducing drag and increasing downforce. The change by Red Bull to the shorter nose a few races ago it became apparent they'd need to make changes further downstream in order to fully maximise the solution. Some of these were implemented in Canada, however, in Austria it became apparent that the new Turning Vanes now had a new ally. Highlighted in green in the image above and captured by fellow tech analyst Giorgio Piola this 'gull wing' is very similar to the 'Bat Wing' used by Mercedes. 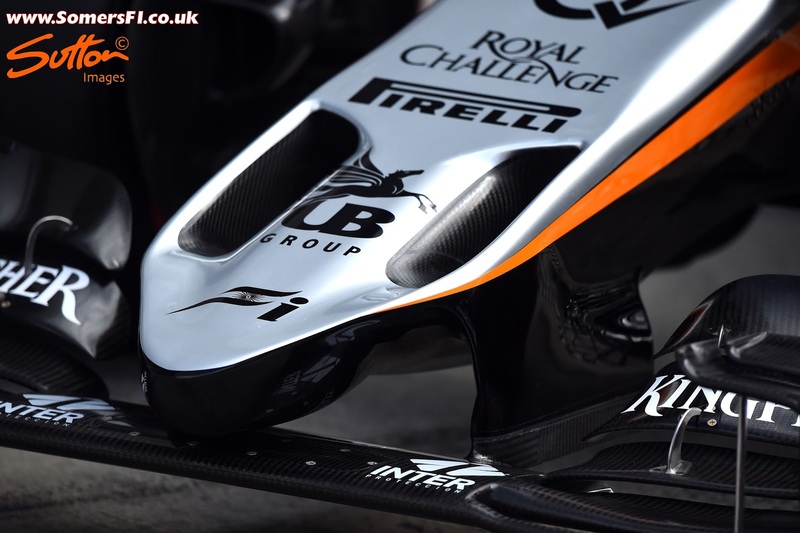 It too is mounted to the ride height sensor but, vastly different in its shape, so it will shed a similar but altogether different airflow structure than the Mercedes wing, which is understandable considering the different nose approaches. The smaller Brackley based outfit delayed their 2015 challenger in favour of a mid-season introduction of a 'B-Spec' upgrade. This allowed the team to spend additional time in the Wind Tunnel facilities in Cologne where they are now taking advantage of a 60% model, whereas previously they'd struggled along with an antiquated tunnel and 50% model. 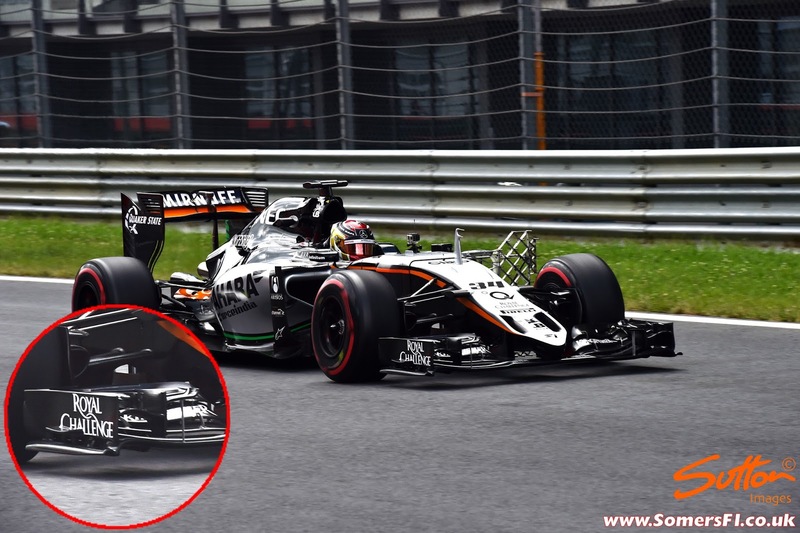 Contrary to popular belief the updates run by Force India in the post Austrian GP test were only part of the revised VJM08 package with a new monocoque and other parts available in Silverstone. The star of the show was the teams new nose design, which features two 'nostrils' (pictured above), allowing airflow to pass from the upper surface below the nose. I'm still to be convinced this is the actual nose that we'll see in Silverstone but rather a placeholder that simulates what the new nose intends to do, if that is the case it should bring a fairly substantial uplift in performance. How much of an uplift will depend on the quality of the other changes that the team make, increasing performance up and down the car. Whilst most focused on the nose solution the team also tested a new front wing solution which bears a striking resemblance to the one that adorns the RB11. Hardly a shock given that another of Red Bull's chief aerodynamacists left around the same time as Prodromou and made his way to Force India. The endplate canard has been moved from the upper right corner and instead occupies a lower position and is flatter in its orientation. Like Red Bull there are two small winglets mounted on the side of the main cascade, although Force India have opted to run a support strut too. You'll note from this image that the team were doing extensive correlation work during the test, utilising both kiel probe arrays and flo-viz paint. 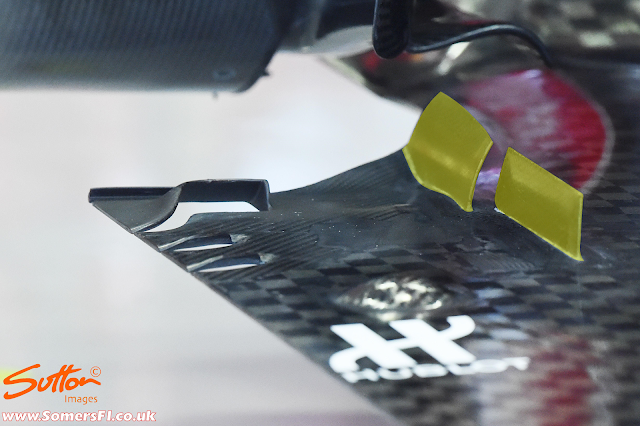 In this image we can see that the team have revised their Turning Vanes, adding a slot into the forward element and making use of that additional through flow. I look forward to seeing the rest of the 'B-Spec' components when the car rolls out at Silverstone, especially as both Ocon and Wehrlein were particularly complimentary of their time with the VJM08. Noticed and pictured by Albert Fabrega this winglet is hung off the strake below and helps to shape and extract the airflow beneath the wing in a more controlled manner. The Italian based 'junior team' introduced several updates to the STR10 for Austria, starting with the front wing I covered for Grand Prix Times. 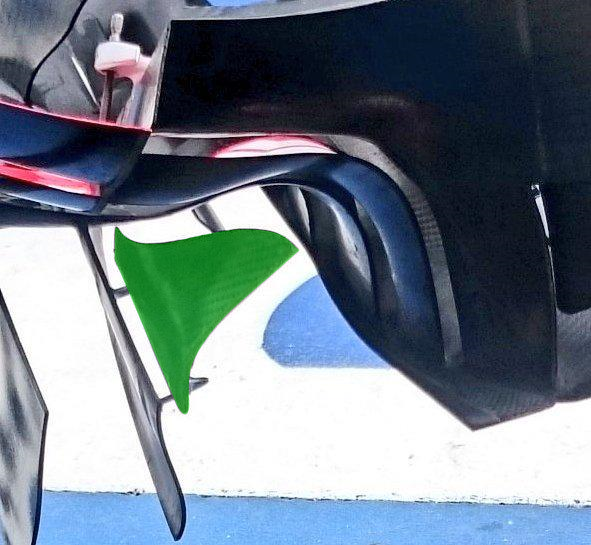 The front brake ducts were also revised, with a curvature added to the inboard fence (marked in green) in a similar fashion to how McLaren shape theirs. 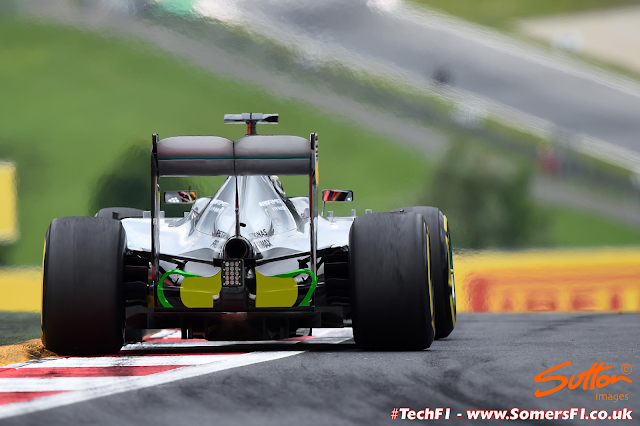 This allows more airflow into the scoopless configuration, whilst changing the shape of the airflow over the tyre. Furthermore, the team added crossover pipework (marked in yellow) which takes airflow collated between the inboard fence and tyre and ejects it through the wheel face, changing the shape of the tyre wake as it does so. At the rear of the STR10 the team have used the conjoined wishbone idea first used by Mercedes on the front suspension of the W05 and repurposed it. 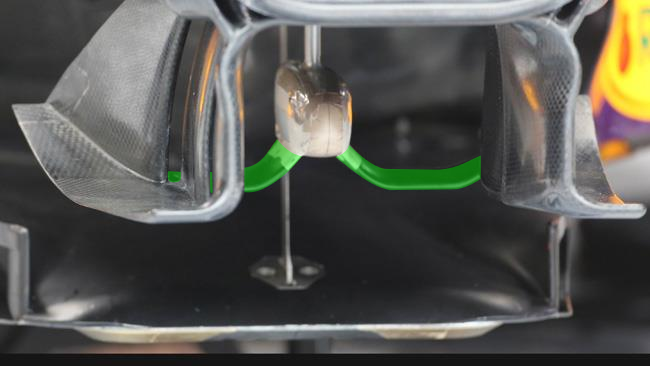 The shape of their wishbone was already shaped to minimise the effect it has on the brake ducts and gap between the diffuser wall and tyre, however, the new shaping goes a little further in achieving their goals. Aside from their new nose, McLaren had a few new parts for the MP4-30 which were only available to Fernando Alonso, I covered these for Grand Prix Times. Who went to force India from red bull?